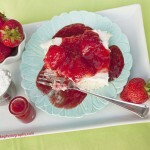 This Strawberry Cream Cake recipe is a big crowd pleaser, and great for summer parties. 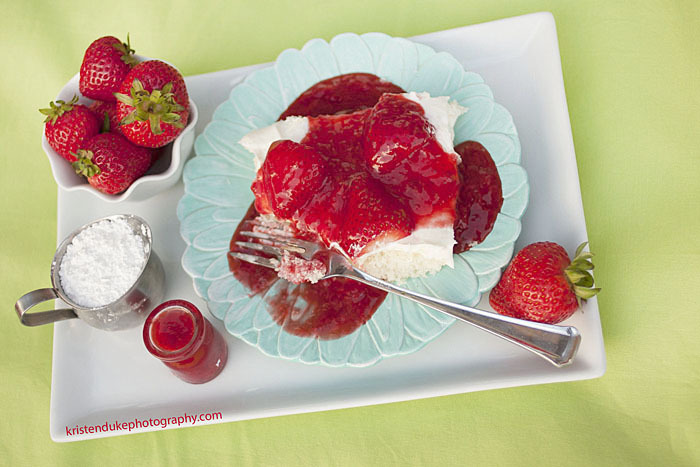 With fresh strawberries, real cream, and delicious jam, it’s sure to please the entire family. This cake is the perfect summer treat. One summer I made it no less than 10 times. It was requested at every baby shower, book club, or girls night I attended. My friend Tiffany introduced it to me, but I didn’t get my hands on the recipe until another friend, Linda, moved away. As a goodbye gift, she typed up a recipe book of all of her most requested recipes and gave it to me. This is no ordinary strawberry cake. 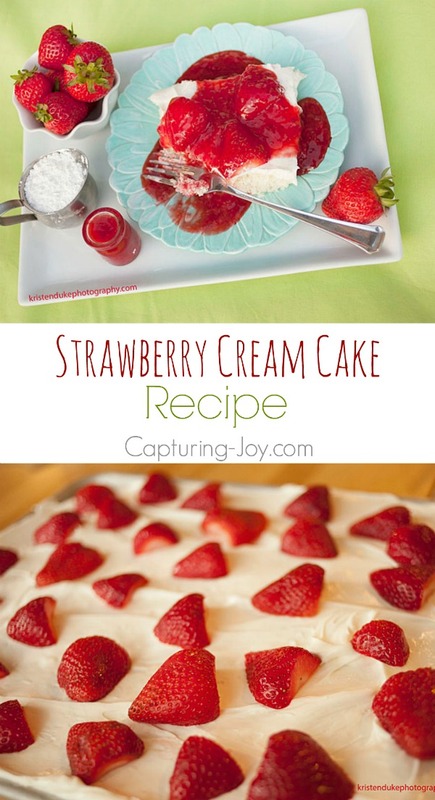 The cake is topped with a light cream cheese frosting, fresh strawberries, and strawberry glaze. You will love it! Start with a jelly roll pan and a white cake mix. If you don’t know what that type of pan isis, it’s big and thin. I like cakes better this way anyway. 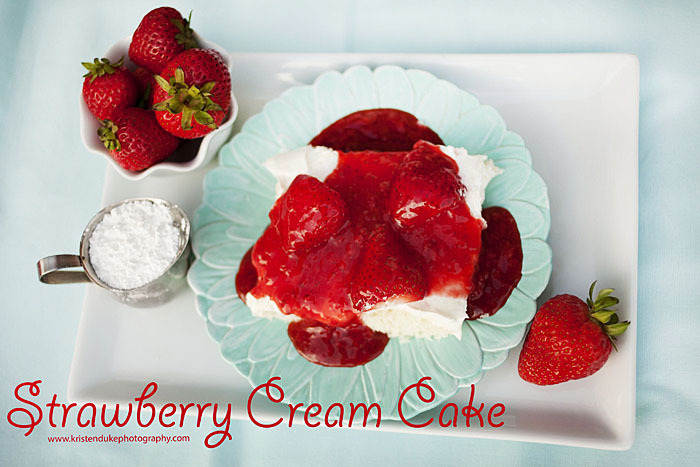 The strawberry glaze and cream on top is where it’s at, the cake is just the base. I added some cut up strawberries to the original recipe because I like texture in my cake. 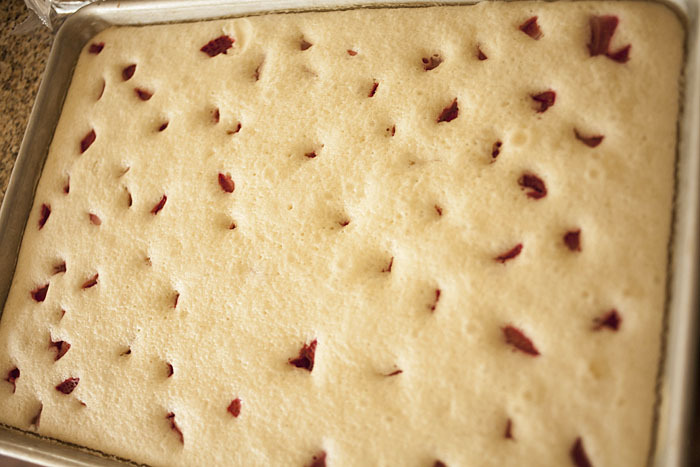 Above is the cooked cake, the strawberries sunk down into the cake. Now it is time for the frosting! I love cream cheese frosting. I pretty much only do cream cheese frosting on everything. And I love the addition of the whipped topping, it makes the perfect light cream cheese frosting for this strawberry cream cake. After frosting, I add more fresh strawberries to the top. You can never have too many fresh strawberries. Right before serving, top with strawberry glaze and enjoy! 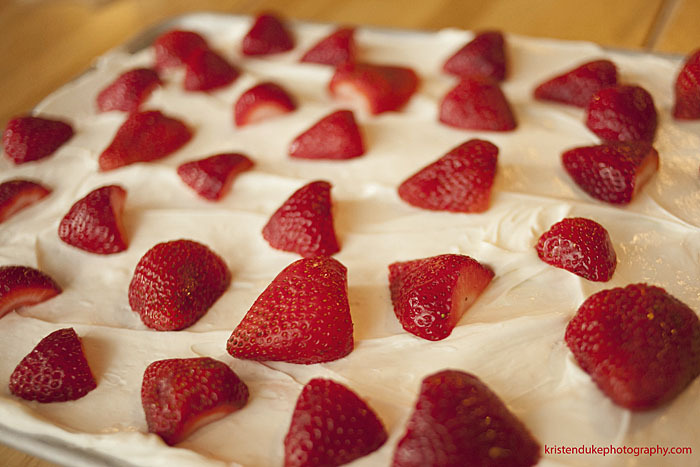 Delicious white cake with fresh strawberries, strawberry glaze, and lots of cream frosting! Prepare the cake mix according to package directions and spread batter in a jelly roll pan. 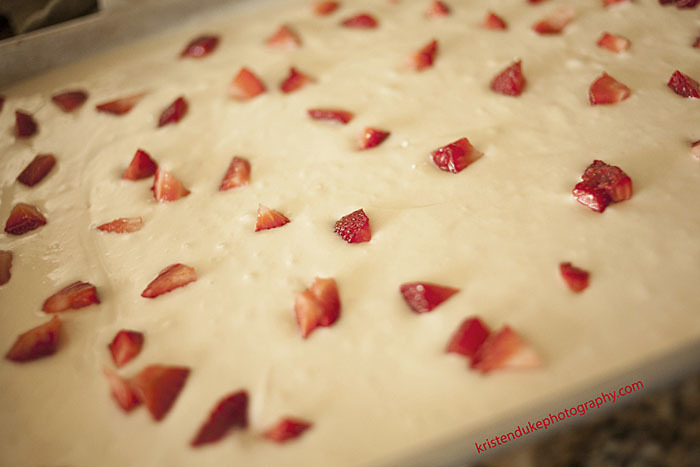 Place 1/2 of the strawberries into the batter. Frost the cooled cake with the frosting and top with fresh cut strawberries. And refrigerate until ready to serve. Once ready to serve, top with strawberry glaze, slice, and enjoy!